Dave Davies Wins the Annual Jack Rutz Memorial Sunfish Regatta!! 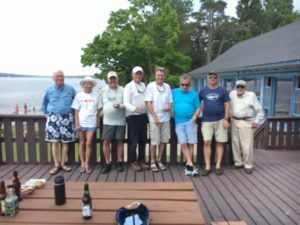 The legendary Dave Davies from Wolf Lake, NY won this year’s Jack Rutz Memorial Sunfish Regatta on Saturday July 14, 2018. Seven boats competed in challenging light and shifty conditions with many lead changes close finishes. Alan Glos from WBYC placed second, and Steven Leach from Newport YC placed third. Davies, a former Sunfish national champion, showed his skill (and cunning!) in the light conditions, and his consistent finishes gave him a solid lead. Kudos to Steve Burrell and Bob Haege and the Yard Staff for great Race Committee work and thanks to Pat and the Galley crew for logistics and a post race lunch. « Hallagan Wins Caz Flash Bash!